I had been ignoring these stories because I felt that the likely had natural causes. Instead we have this which is a bizarre travesty. What are they thinking? They will always go away on their own. Then we get their reasoning and it is essentially rationalizing the activities of a far too enthusiastic death squad. Yes, it does become necessary to carefully cull specific populations. By that I do mean deer herds, wild pig herds whose growth conflict directly with farming and promote a larger carnivore population which is hardly wise. These culls also need to be directly traded into the food chain and correctly counted. Only by establishing real value will we ever get a correct count. Remember the mysterious deaths of millions of birds a while back? Everyone was wondering, what was causing the sudden death of all these birds? There had been all kind of conspiracy theories surrounding the death of all those birds. Everything from the environment was killing them to bird-suicide. Well, some of you may have heard that the mystery has been solved. The USDA has admitted to being behind these mysterious bird deaths. Yes, the United States Department of Agriculture has publicly admitted being responsible for the mass poisoning of tens of millions of birds over the last several years. However, there is more to this story than meets the eye! Indeed, the U.S. Department of Agriculture has publicly admitted it is responsible for the mass poisoning of tens of millions of birds over the last several years. 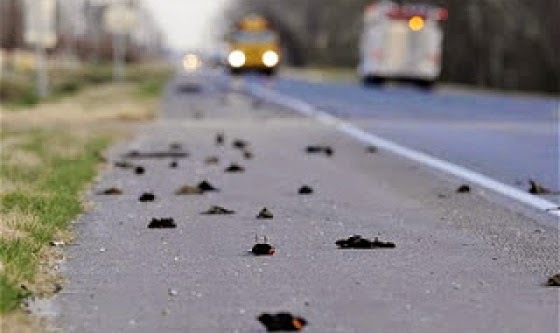 It’s all part of the USDA’s program called “Bye Bye Blackbird,” and we even have the USDA’s spreadsheet where they document how many millions of birds (and other animals) they’ve poisoned to death. After hundreds of starlings were found dead in the Yankton Riverside Park, concerned citizens began investigating. After a while, a USDA official called the local police and admitted they had poisoned the birds. “They say that they had poisoned the birds about ten miles south of Yankton and they were surprised they came to Yankton like they did and died in our park,” says Yankton Animal Control Officer Lisa Brasel. So why was the USDA poisoning birds in the first place? What’s was the purpose of killing the animals? There were too many of them. A Nebraska farmer was apparently complaining that the starlings were defecating in his feed meal. The answer to this conundrum apparently isn’t to cover your feed meal but rather call the USDA and ask them to poison thousands of birds. Bannerman claimed; “We’re doing it to address, in this case, agricultural damage as well as the potential for human health and safety issues,” she said. That’s just a lie, of course. In what universe do starlings pose a threat to human health and safety? Remember, these are mass killings funded with your tax dollars. The kicker is, that the government is, in fact, responsible for many of the other mysterious animal deaths that have been reported across the country. Yes, many people had already heard that the bird killings were the handy-work of the USDA, but that’s not all they’ve been killing off. The federal government thinks nothing of murdering million living, breathing animals, showing their total lack of respect for wildlife. Birds aren’t the only animals on the USDA death-list. Besides the 1,046,109 cowbirds, 1,259,714 European Starlings, 965,889 red-winged blackbirds, 93,210 Grackles, 96,297 pigeons and 24,519 Canadian geese, the USDA has ordered the slaughter of 27,000 beavers, 1700 bobcats, 81,000 coyotes, 2,000 gray foxes, 336 mountain lions, 1900 woodchucks, 130 porcupines, 12,000 raccoons, 20,000 squirrels, 30,000 wild pigs and 478 wolves. And if the USDA poisons birds because certain groups become too populous, what do you suppose is planned for when human population grows too large? There are too many people now. So are they or another government agency going to start killing off humans? Believe it or not, that’s what some of our leaders, like Bill Gates, would like to do! The issue of overpopulation is older that actual overpopulation itself. Indeed , the King of England openly stated that the overpopulation of third world nations pose a threat to the international elite of global power as long ago as 1944. However, the issue of overpopulation was first brought to mainstream society by Charles Darwin a few years later, in 1952. Regarded as one of the greatest minds in history, Darwin came up with the solution he described in his book, The Next Million Years, introducing “population control” and the “future history” of mankind to the world. Back on October 10, 2010, I wrote the article, New World Order & American Elite call for Population Reduction, where I try to explain to the world the intentions of these madmen. With the same reasoning as Charles Darwin almost 60 years ago, population control will not impact the more intelligent, capable people who have the ability to move human civilization forward. The rich and powerful, the scientists and engineers, the doctors and innovators would be spared. “It’s only the stupid people that are going to be killed off anyway, so this is actually helping the future of humankind,” those in control would say. If mankind is to avoid extinction, he will first have to learn how to be human, for the killing of less intelligent individuals or species, shows that he is the least intelligent of them all. While I agree that killing other species in mass to justify the production of food for humans is immoral, still I think that the over population of the earth is more immoral and will have far greater consequences to the earth in the long run. God told Adam and Eve to "Be fruitful, and multiply, and replenish the earth,", not OVER populate it. Even 3 thousand years ago Joshua and his Israelites created genocide against the Canaanites in order to grab their land and possessions. We continue to this day to live in a state of perpetual war. Even our current 6 billion people is not sustainable because we are currently exhausting every available food source and other supplies. Millions of people go to bed hungry. Millions live in harm's way of hurricanes, floods, tsunamis, earthquakes, volcanos, and other dangerous areas because there is no other place to live. We have enslaved virtually every other species, forcing them to live in pens or cages under inhumane conditions to become food for us yet our populations continue to expand. We turn our farm lands into housing tracks and in the process destroy the very things that support us. Instead of creating jobs, be build bigger machines that put more people out of work. Reluctantly and with reservations I have to agree with Bill Gates and others and I have to support humane efforts to control population such as contraception and abortions in early stages. Even forced sterilization of certain individuals who will not control their own urges. Certain religious groups whine and complain, but at the same time they support the construction of massive weapons of war to be waged on other countries and in most cases it is the poor and underprivileged who are forced to flee and live is camps in a host country.